With BullionStar, you can save for your retirement with IRA, Superannuation or Retirement Accounts. To open such an account, go to Sign Up and select "Trust / Foundation / IRA" under Account Type. Individual Retirement Accounts (IRAs) are account structures under US law that provide for saving for retirement. IRAs are available to US residents and can be opened by anyone with taxable income. The attraction of an IRA is that it is tax-incentivized, for example, the contributions can be funded from pre-tax income. One of the most flexible structures available for IRAs is a self-directed IRA. Self-directed IRAs facilitate investment into a wide variety of assets including precious metals. Therefore, an IRA, if self-directed, can purchase precious metals as an asset while retaining the tax benefits associated with the IRA. IRAs can hold a variety of assets, but an IRA that is set up to invest specifically into precious metals is usually called a precious metals IRA. There are a number of different types of IRA such as 'Traditional' IRAs, ROTH IRAs, SIMPLE IRAs and SEP IRAs. All of the above IRA types can be opened as self-directed IRAs. IRA legislation states that an IRA custodian has to be based in the US, but the legislation does not impose such a requirement for the storage facility that stores the precious metals. Therefore, the precious metals can be stored or vaulted internationally. BullionStar is at any time able to work with any and all IRA custodians that offer precious metals IRAs. BullionStar's preferred partner is an IRA custodian called IRA Club. With IRA Club, you can set up a self-directed custodial IRA and invest the funds held in the IRA into purchasing and storing bullion with BullionStar. IRA Club offers traditional, ROTH, SIMPLE and SEP versions of self-directed IRAs within its self-directed custodial IRA suite. 1. To purchase eligible precious metals from BullionStar to hold within an IRA, the IRA holder must have a custodian account, e.g. a self-directed custodial IRA. If you don't already have a custodian account, we suggest you to open a self-directed custodial IRA account with our preferred partner, IRA Club. 2. Once the custodial account has been opened, it can be funded by a contribution, a transfer from another IRA, or by a rollover from another pension plan such as a 401k. 3. Following this, to purchase and store precious metals you will need to open an account with BullionStar. Go to Sign Up where you select "Trust / Foundation / IRA" for Account Type in the dropdown. Input the IRA name or LLC name (if the IRA owns an LLC which in turn owns the bullion) in the field for "Account Name". Select "IRA" for Entity in the dropdown. 4. 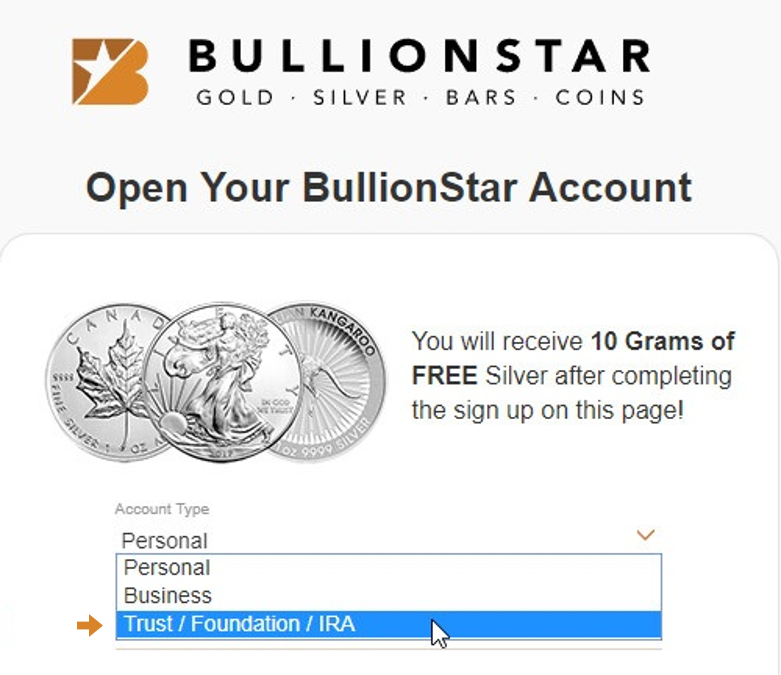 Next, place a buy order with BullionStar for precious metals and send the order confirmation to the IRA custodian to settle with your IRA funds. 5. BullionStar will then process your purchased precious metals into BullionStar vault storage and update you via an order status e-mail and SMS text message. The IRA can then at any time sell, audit or physically withdraw/ship the precious metals to another depository. Regarding eligibility of precious metals, IRAs can invest in investment grade gold, silver, platinum and palladium bullion bars, as well as gold, silver, and platinum coins issued by the US Mint, and gold, silver and platinum coins issued by the mints of other countries. Under IRA rules, the minimum purity for gold held in an IRA is 0.995 fine, for silver the minimum purity is 0.999 and for platinum 0.9995. This means that for gold, an IRA can hold any gold bars with a gold purity of 99.5% or above. For gold coins, eligible coins include US Mint American Gold Eagles and Gold Buffalos, and any other gold coins with a purity of at least 99.5%. This would cover all of the popular gold bullion coins such as Gold Maple Leafs from the Royal Canadian Mint, Gold Kangaroos and Gold Lunars from the Perth Mint, Chinese Gold Pandas, Austrian Gold Philharmonics, as well as Gold Britannias (from 2013 onwards). For silver, an IRA can invest in any silver bar as long it has a silver purity greater than or equal to 99.9% silver. Eligible silver coins include US Mint American Silver Eagles and any other silver bullion coin with a silver purity of 0.999 or higher. This would include Canadian Silver Maple Leafs, Perth Mint Silver Kangaroos, Koalas, Lunars, and Kookaburras, Chinese Silver Pandas, Austrian Silver Philharmonics and Silver Britannias. The conventional interpretation of IRS rules is that bullion rounds, such as e.g. the Singapore Silver Merlion round, are eligible for inclusion in IRAs. IRAs are however not allowed to invest into numismatic and collector coins. For platinum, an IRA can invest in any platinum bar that has a platinum purity of 0.9995 or higher. Eligible platinum coins would include US Mint American Platinum Eagles and any other platinum coin with a purity greater than or equal to 0.9995, such as Canadian Platinum Maple Leafs, and platinum coins issued by the Perth Mint.